So, Florence is great. It’s amazing, it’s a buzzing, beautiful city that is overwhelming you with the amount of historical sights and museums it has to offer. 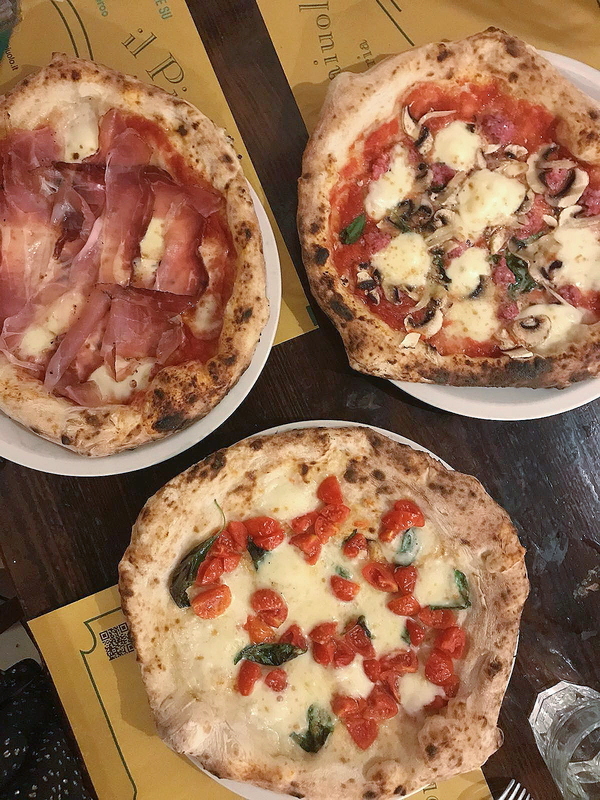 Same with food, there is so many restaurants and little hidden spots where you can enjoy some delicious pizza, pasta, or, their famous Florentine steak (we were 3 girls and shared a piece of 1.4kg. You can do it! – ok, parts of it was bones, but still). There is just one “but” about this city; it can get very, very crowded, up to the point where you have to push through the crowds. Maybe that’s because we went in July, but apparently it doesn’t become much less in spring. So chose a wise time to go, to avoid huge crowds. We stayed for 2 days, which I found perfect, but if you want to visit all the museums you should probably plan in some more time. Before coming to Florence we stayed for 1 day in Bologna (Guide Here) and for one night in a beautiful Agritourismo in the Tuscan countryside, which I’ll talk more about further below. Enjoy! Delicious Pizza with all kinds of topics for a fair price. 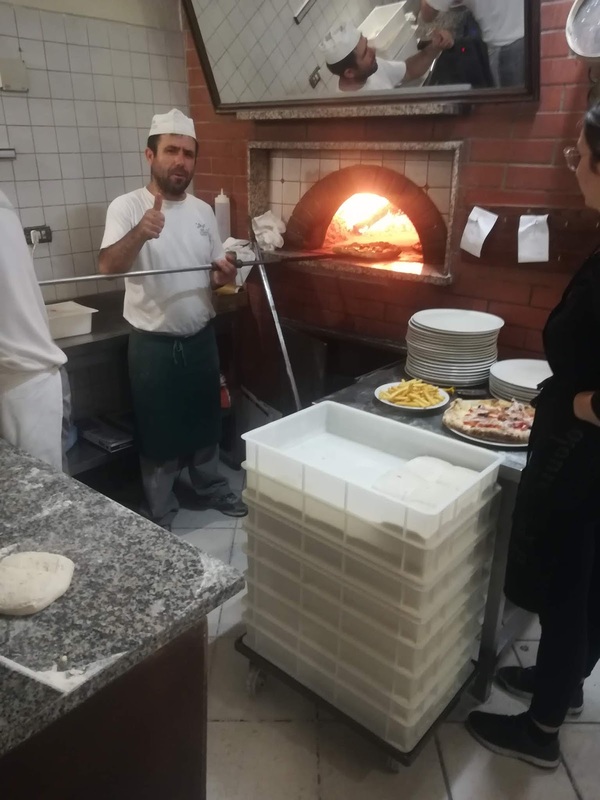 The waiters are rather short in their answers and quick in actions, but the Pizza maker (pizzaiuolo) seemed like a very nice and fun guy. A simple place (reservation recommended) in a cool part of the city, where many other nice restaurants are located. The Pizza here is the one with the thicker dough: Napoli-style. We were three and shared three different Pizzas to try something different with every bite. Located on a street just to the right of Ponte Vecchio, this restaurant is visited by some tourists, but also by native Italians who are meat lovers. You can get pork, wild boar and of course the famous Florentinian steak here; not less than 1.25kg though, so start thinking how much of the aged meat you could eat. You pay per grams (100g/5E), so you’ll end up paying around 70E for a piece if you take the smallest amount possible. Their burratina con tartufo is not to be missed and neither is the traditional dessert: a sweet dessert wine and some Cantuccini, to be dipped into the wine and then into your mouth. Waiters are nice, maybe a bit hectic, but overall it was a nice experience. The interior is quite rustic, dark with a lot of dark brown wooden details and furniture, so if you wish to sunbathe while eating, better chose another place. This place was recommended to me by an Italian, so I figured it must be worth to go. Delicious starters, we had burrata and bruschetta, good selections of wines (and very patient waitresses and waiters to advise you on them) and traditional main dishes, sometimes with a twist. I had Tortelli, filled with pear in a sauce from taleggio with green asparagus and it was very delicious, a great mix of flavours. The fried polpo (octopus) with pea puree was very tender and flavourful, too, unfortunately not fresh though but frozen before being prepared. There’s seating outside and inside and our waitress was incredibly nice, the others looked a bit as if in a bad mood, but can’t tell. Well, there’s not much to say, just that the ice cream here was amazing and price-wise very fair. Think I had a scoop of passion fruit and some red fruit flavor, both delicious melting down my hands while I was looking at Ponte Vecchio from far. The following places were on my to-do list, recommended by Italians, but unfortunately in one and a half days it's impossible to try 10 different restaurants. But I put them on here anyways. Aquaflor: Beautiful, romantic perfume, room scent and soap shop. Big couches and leather airmchairs, dark wooden drawers and petals everywhere. My favourite soaps here are verbena, rose and cinnamon. The food market reopened in 2014. On the first floor, there’s a modern food hall, featuring several stands that offer everything from Pizza, to truffle dishes, to antipasti platters, to meat and fish. Have a Cappuccino and cannoli (crispy Italian pastry filled with ricotta cream) and sit down at one of the high tables in the middle of the buzzing place. In case you can’t get enough, there’s an “Eataly” shop just at the end of the hall where you can buy pasta, oil, wines and other Italian products to bring home. In case you want to escape from the city, a nice Agritourismo on the countryside is the perfect thing to do. They can differ from each other to some extent, but in general Agritourismos are family run guest houses on the countryside, which very often offer homegrown and regional food and usually also a bed to sleep in. They can be more luxurious or simpler, but so far I’ve only had great experiences no matter which option I chose. Located in the heart of Tuscany, surrounded by olive groves and small mountains, this place offers a beautiful view. It has around six rooms I’d say, offers breakfast, lunch and dinner prepared from ingredients growing in the owners’ own little garden. The breakfast was a lovely selection of homemade cakes, jams and homegrown fruit and for dinner we had a simple but honestly delicious 4-course menu. A spinach tart, fusilli with peppers, the best roastbeef I ever had and a semi-freddo dessert. The wine list gives you some variety to choose from, too and the prices are more than fair. They are overly friendly making your stay a true pleasure. I should also mention that there is a decent pool with a beautiful view at the region.